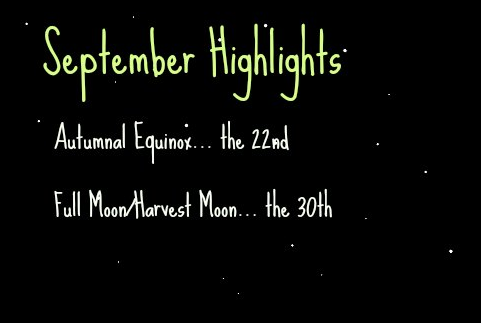 The closest full moon to the autumnal equinox is called the harvest moon. The harvest moon is not necessarily bigger or brighter than a regular full moon. However, the moon’s orbital path is unique at this time of the year, and so it rises earlier than usual. Because of this, there is a shorter than usual time between sunset and the rise of the full moon, which means a nice, bright late evening sky. This is due to an optical illusion, the reason for which is still debated. Whenever the full moon is closer to the horizon, it appears to be much larger than when it is not. However, you can de-bunk this illusion very easily. Hold up a dime toward the full moon when it is near the horizon, and then a few hours later when it is farther up in the sky. You will notice that even though the moon appears larger when it is near the horizon, the dime will cover up the same amount of the moon in both positions. Another fun thing to try is to bend over and look at the full moon from between your legs. When you look at it from this position, it looks much smaller than when you look at it right side up! 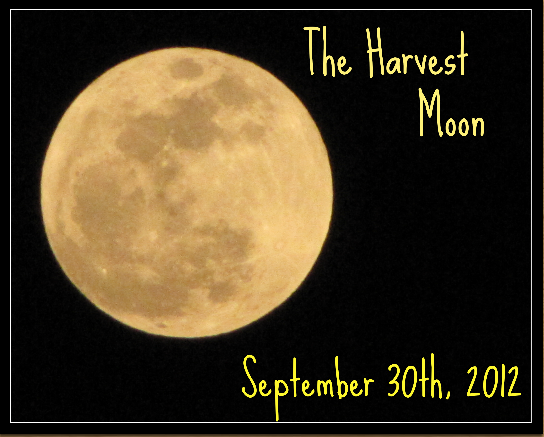 Why is it called the “Harvest” moon? Historically, the early brightness of this full moon helped farmers to gather their crops, despite the days getting shorter and shorter at this time of year. As the sun begins to set, the full moon rises, illuminating their fields. Save time on academic papers with research papers writer service. Today farmers rely on artificial lights to guide their tractors, but in the times before electricity, the harvest moon was a huge help. Here at Lie Back, Look Up, you will find plenty of stargazing and astronomy activities to do with your family. Many of these activities include free printables, as well as some tutorials and videos. Please let me know in the comments how your family has enjoyed these activities! 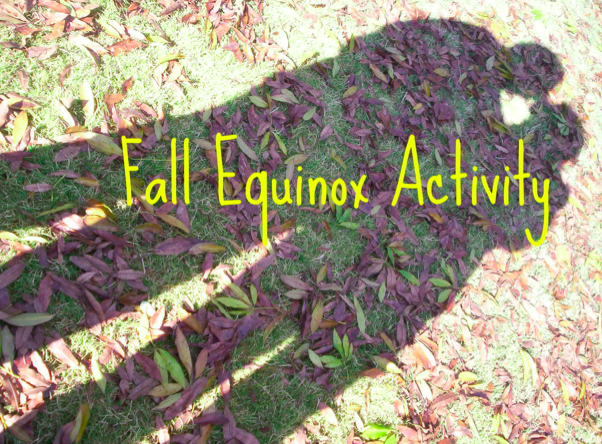 The autumnal equinox, occurring this year on September 22nd, is a great opportunity to help your kids explore why we experience seasons. The explanation behind the occurrence of seasons is one of the biggest misconceptions in astronomy. Many children believe that the Earth is closer to the sun in the summer and farther in the winter, thus the seasons. And while some children understand that seasons have to do with the tilt of the Earth, many still have trouble explaining how this results in seasons. One of the greatest activities that I’ve done with my middle school students to help them understand this concept (as well as seasonal constellations) is “kinesthetic astronomy”. This involves using your bodies to model the objects and movements in the solar system. The original idea and complete lesson plan for this activity can be found here. You can modify this activity to focus only on the “reason for the seasons”, as explained below. Begin by explaining that you will be using your bodies to model the Earth. The North Pole is at the top of your head, the South Pole at your tailbone, and the equator would be your waist. Use a basketball or other round object to model the Sun. Position yourselves so that you are facing the sun. Point out where your home would be on your body– North America would be on your chest, so when you are facing the sun, North America is experiencing daytime. Explain that the Earth rotates on its axis, which would be an imaginary line, going straight up out of your head and straight down out of your tailbone. Model the Earth’s rotation on its axis by spinning counterclockwise. Model the Earth’s orbit (revolution) around the sun by traveling around the sun. Kids can have quite a bit of fun by rotating and orbiting at the same time! Once your child understands those two basic motions, rotation and revolution, you can begin talking about the tilt of the Earth’s axis. The North Pole of the Earth’s axis is tilted toward the star Polaris, which is 500 light years away. Have your child tilt from their waist approximately 23.5 degrees from vertical. Now you can again practice rotating and revolving, but this time incorporating the tilt of the axis. This can be very tricky but a lot of fun! Remind your child that they must keep their bodies tilted toward Polaris the whole time. The direction of the tilt should not change as you rotate and revolve. Have your child move through the Earth’s orbit around the sun slowly. Point out that at one point his or her chest is pointed toward the sun and at one point it is tilted away from the sun. Also, there are two in-between points in the orbit. You can also mention that the tilt of the Earth’s axis has not changed (it is always towards Polaris), but their orientation to the sun has changed because of the Earth’s tilt and revolution. When the Earth is tilted toward the sun we experience summer and when we are tilted away from the sun we experience winter. The two in-between points are fall and spring. To explain why the tilt towards or away from the sun causes seasons, you can remove your object representing the sun and instead use a flashlight to represent the sun. 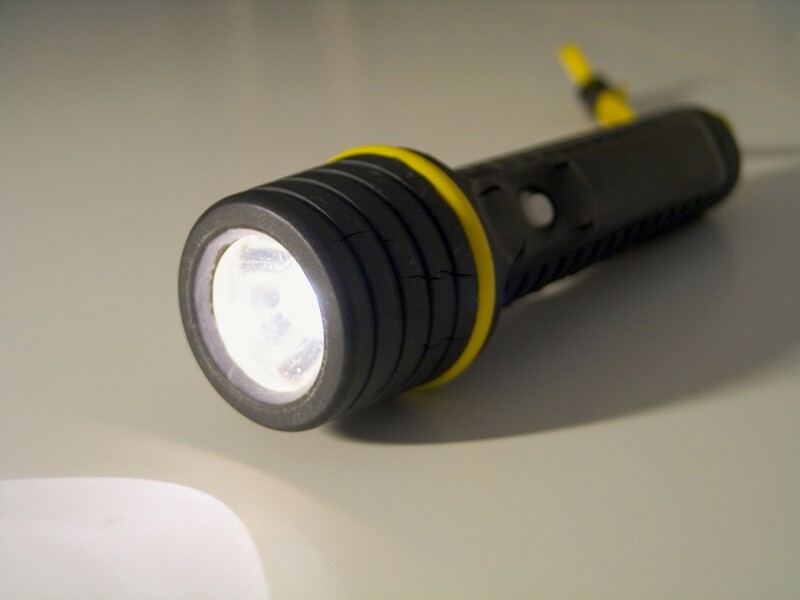 Stand in the middle while your child orbits around you (with the tilt), and shine a flashlight at his chest. Have him stop when he is tilted toward the sun and look at the flashlight beam on his chest. It should be concentrated in a small circle. This shows that in the summer, the sun’s rays are very direct on the Earth. Next have him stop when he is tilted away from the sun and look at the flashlight on his chest. It should be spread out, which shows that in the winter, the sun’s rays aren’t as direct on the Earth. In the fall and spring positions, the Earth is in-between the positions of direct and indirect rays. Here is a great interactive to test their understanding after the activity! If you’ve been visiting Lie Back, Look Up for awhile (or any other stargazing sites), you’ve probably been reading about the different constellations that you can view each season. You might also be wondering why we see different constellations each season. Understanding this explanation involves visualizing the Earth-Sun relationship in our solar system, as well as our solar system’s position in the Milky Way Galaxy. It is helpful to remember that the stars are always up in the sky, we’re just not able to see them during the day due to the brightness of the sun. Without the sun shining during the day, we would be able to see the winter constellations during the daytime in the summer (and vice versa). Because the Earth changes position around the sun throughout the year, we get a different view of the stars in the Milky Way Galaxy during different times of the year. Looking at the drawing above, you can see that on December 21st, we are able to see the stars in the constellation Gemini at night. We would not be able to see the stars of Sagittarius on December 21st, because they would be in the daytime sky. If you are looking to explain this to your kids, it is a great idea to “act out” the drawing above. Print out pictures of the constellations in the drawing and place them around the room. Use a basketball to model the sun in the center. They can rotate to experience day and night, and walk around the sun to model the orbit throughout the year. Have them stop in different positions throughout the year, and ask them which constellations they would be able to see at night. They will have to spin around in their position to face away from the sun, in order to view the nighttime constellations. 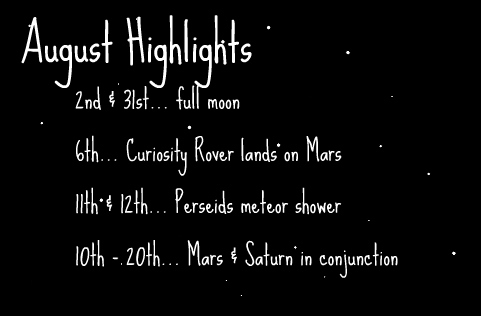 Check out our What’s Up in the Sky this Month page for an idea of planets and constellations to view in September. Don’t forget to print off the free Summer Sky Map as well! When most people are asked to identify one “constellation” in the night sky, their first answer is often the Big Dipper. But, in fact, the Big Dipper is part of the constellation Ursa Major (the Big Bear), and is not an actual constellation by itself. The Big Dipper is what we call an asterism, which is an interesting and well-recognizable star pattern, while not one of the official 88 constellations. The Dipper can be found in many myths and legends, and is called by many names– including the Drinking Gourd and the Revolving Man. Regardless of what people have called it, it has been used throughout many cultures and many generations as a celestial tool for navigation. This is due to the fact that the Big Dipper can be seen year-round, and changes position in the sky throughout the year. While most of us don’t plan on using the Big Dipper as a navigational tool anytime soon, it is helpful to know where to find it in the night sky throughout the year. Here you can see that in the fall the Big Dipper is oriented like a spoon resting on the horizon, ready to catch the falling leaves of autumn. In the winter the Dipper is upright on its handle, like an icicle hanging down from the bowl. In the spring the Dipper is upside down, like it is pouring out heavy springtime rains; in the summer it is upright on it’s bowl, with the handle pointing up to the heavens. The reason that the Big Dipper changes position like this is because in the northern part of the sky, all of the stars appear to rotate counterclockwise around Polaris, the North Star. Keep in mind that all of the stars “appear” to rotate in the sky due to the fact that the earth is rotating on its axis. Because the north pole is tilted towards Polaris, all of the stars in this part of the sky appear to rotate around this fixed point. This is why the Big Dipper appears to rotate around Polaris in a counterclockwise direction throughout the year. 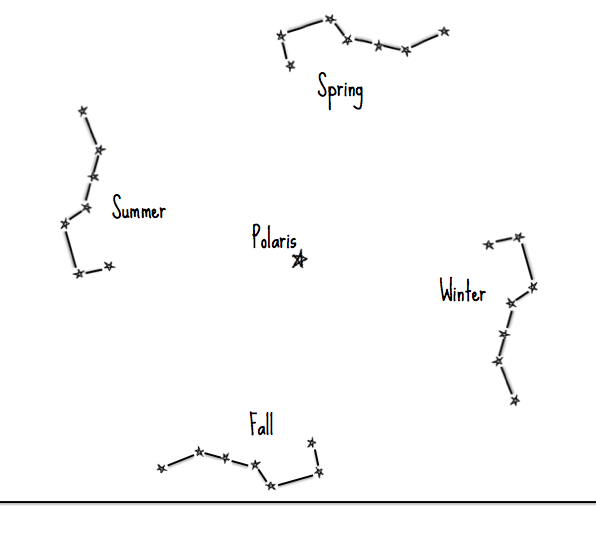 The Big Dipper printable is available for you to download, with the drawing and seasonal explanation above. 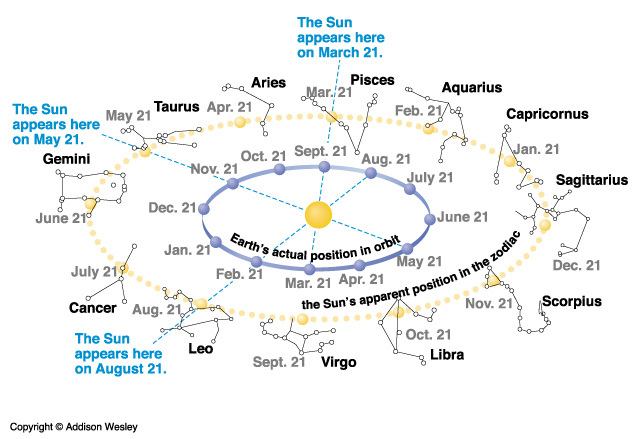 Hopefully, this handy reference sheet will help you year-round while stargazing. Many of us are busy getting ready to send our children back to school, and some of our children have already started. Being a parent and a teacher, I find this busy time of year to be very exciting– full of new beginnings and new possibilities. Starting the school year in the most organized way possible helps to lessen the inevitable stress that comes with the busyness. 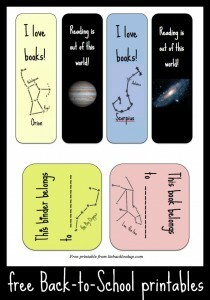 I’ve put together a few printables, with an astronomy theme, to help during this back-to-school time. The first printable contains four bookmarks and two binder/book labels, and the second printable is a homework chart for your child. 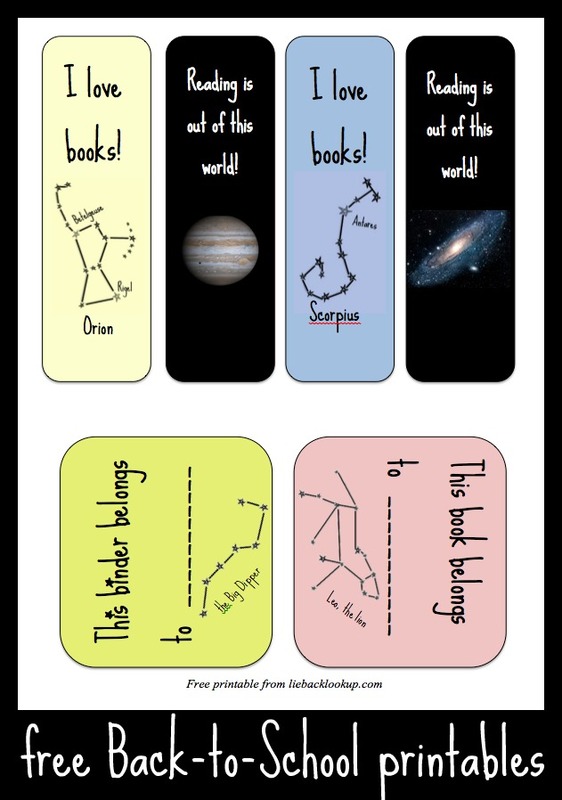 There are many printables out there for bookmarks, charts, etc.– but only at Lie Back, Look Up can you find these unique ones for your astronomy-loving kids. A important thing to remember when stargazing with children is that you need to give them something to “do”. Many children will become bored with just looking up at the sky for long periods of time, so bringing along a great music playlist can help keep everyone occupied. These are just a few of my favorite astronomy-themed songs. I especially love the entire Here Comes Science CD by They Might Be Giants– it is filled with fun science-themed songs for kids, which my seven and four-year old can listen to for hours. 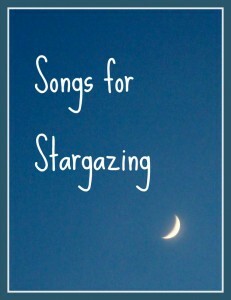 So let me know, what is your favorite stargazing-themed song? Feel free to take a brake for custom essay service online! 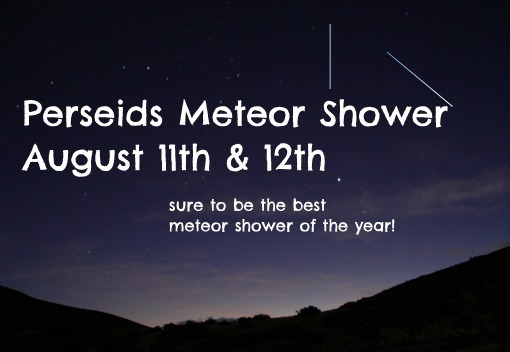 Coming up on the nights of August 11th and 12th is a great opportunity to watch a meteor shower. Many people consider the Perseid Meteor Shower to be one of the best shows of the year, with up to 100 meteors per hour viewable in a dark sky. Start watching after sunset, and as soon as the sky is nice and dark you should be able to see plenty of meteors lighting up the night sky. The waning crescent moon doesn’t rise until after midnight, so you won’t have to worry about the light of the moon obscuring your view. 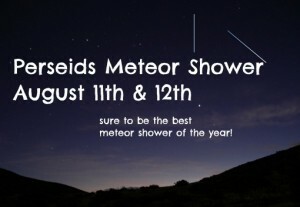 This meteor shower is a great opportunity for stargazing as a family. If you are blessed with a clear, dark sky, even the youngest child should be able to spot a few meteors streaking across the sky. You might have a hard time snapping a picture with a point-and-shoot camera, but the memories that you’ll capture with your kids will last a lifetime. Don’t forget to bring along your child’s Stargazing Diary and a few snacks. 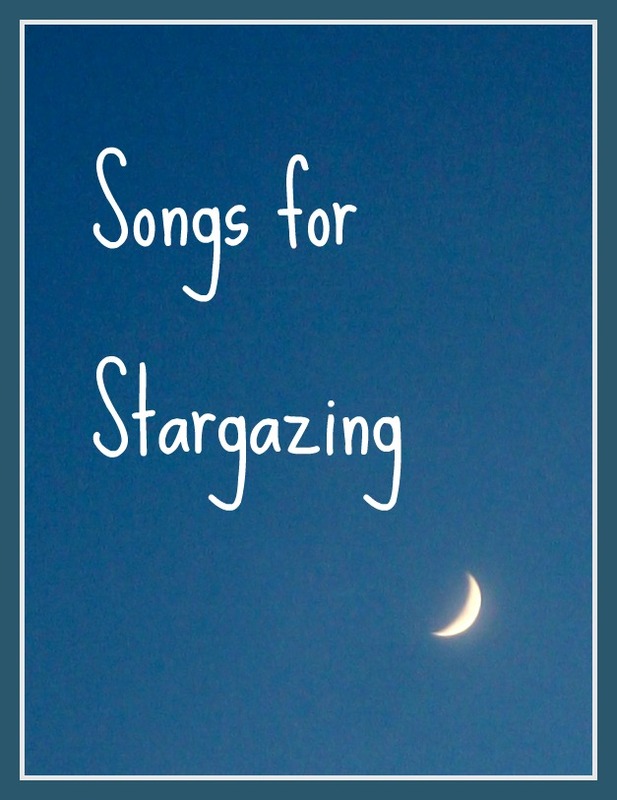 And stay “tuned” for next week’s post on my suggestions for your Stargazing Playlist– just in time to view the Perseids! The landing of the Curiosity rover on the surface of Mars on August 5th can be an exciting event for your family. Your first step is to brush up on the basics, then choose a few of these activities to do together. 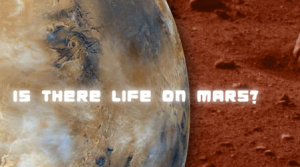 This website allows you to “ask” questions about Mars to a computerized scientist. While typing your questions to a virtual scientist has its limitations, this site does a pretty good job of interpreting your questions and giving back detailed answers. 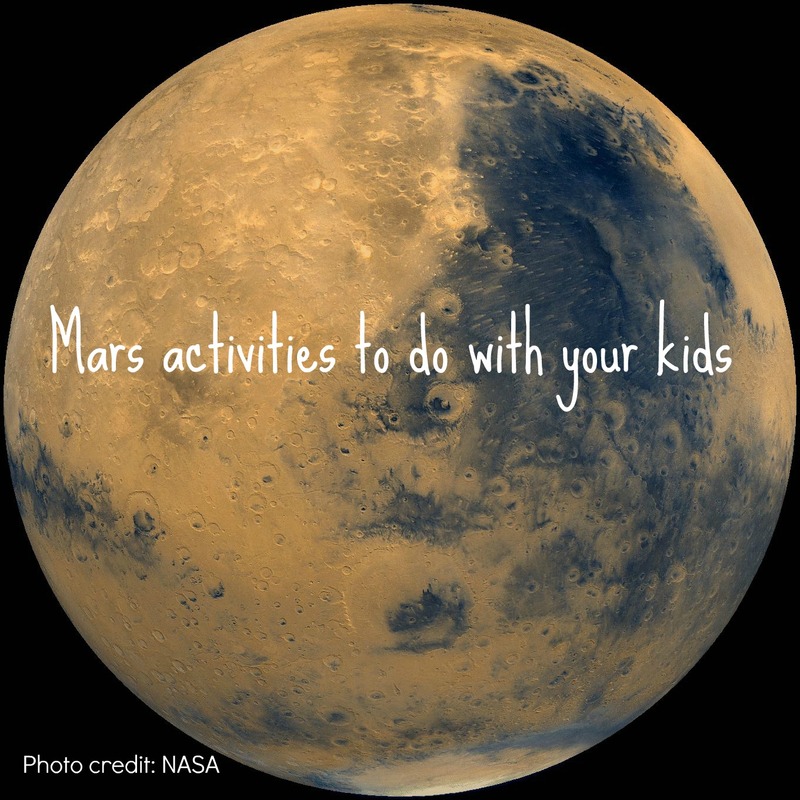 Dr. C seems to know quite a bit about Mars, and this can be a fun way for young children to learn a little more about the Red Planet. 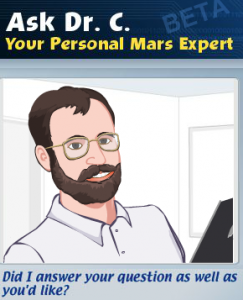 You can also ask him questions about the Mars Science Laboratory mission. Your older children can determine on their own what the scaled down size should be by dividing the actual diameter (in kilometers) by a factor of 638. 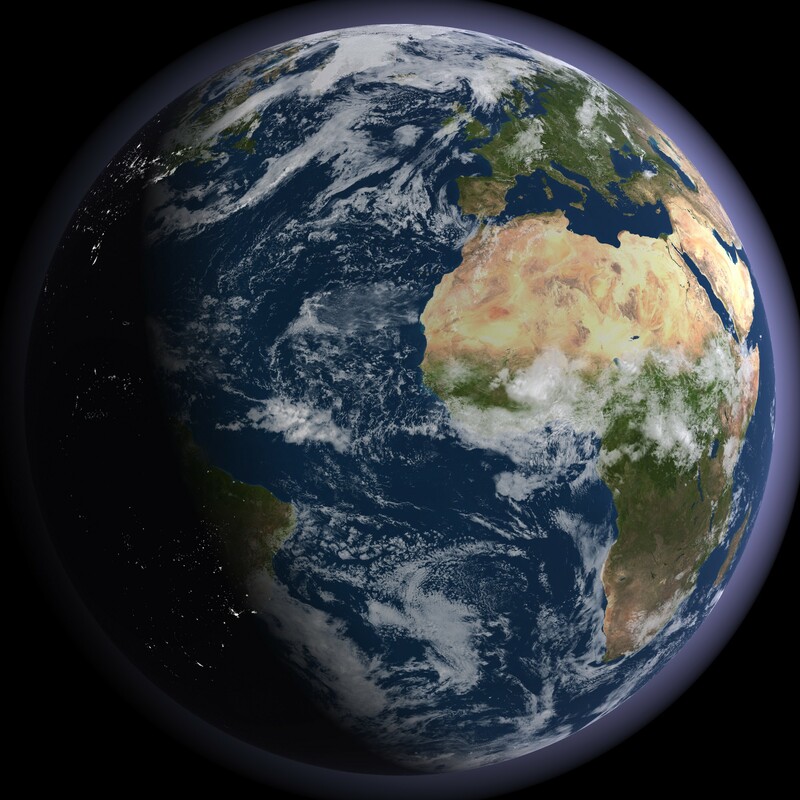 (i.e., Earth’s diameter is 12,756, so dividing it by 638 gives a scale size of approximately 20 centimeters.) You can give your teenager a challenge by having them come up with a scale factor to use in this model, then ask them to blow up their balloons using that scale. They will probably come up with a different scale, but as long as they can get the balloons that size, it will work! 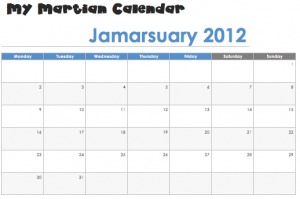 Harness your child’s creativity by asking them to create a Martian calendar. Discuss with your kids the definition of day (the time it takes a planet to rotate once on its axis) and year (the time it takes a planet to orbit once around the Sun). 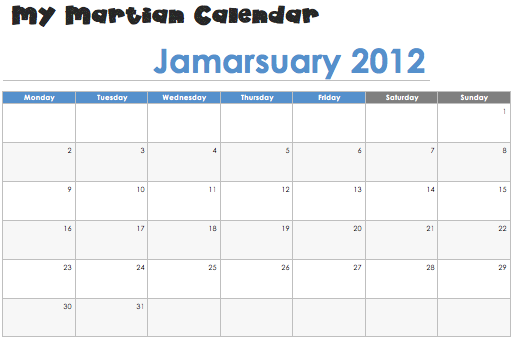 Once they’ve designed it, you can have them construct their actual calendar on the computer or by hand. 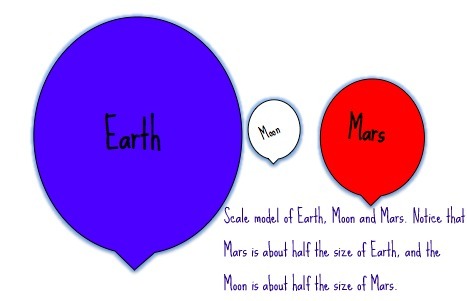 Mars has a tilt similar to the Earth’s, so Mars has seasons too! Are you going to have weeks? If so, how many days will you have in a week? Are you going to have months? How many? How many days/weeks in a month? What will you name them? Will you need to have any “leap years”? Are you going to have holidays? This NASA website has quite a bit of detailed information on this mission, but my favorite part are the fantastic videos. You can watch everything from Robotic Arm Target Practice to Building Curiosity: Mars Rover Power. Craters are a very common planetary surface feature, found on all of the terrestrial planets. We don’t see very many on the Earth’s surface due to the process of plate tectonics and surface weathering. Planets like Mars, without any active plate tectonics or flowing water (at least, not at the present!) 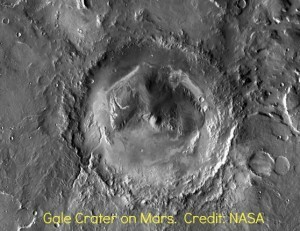 have a greater number of craters, which indicates a much older surface. Impact craters are caused by projectiles, traveling at very high velocities, hitting the surface. Exploring the effect that the size and velocity (speed) of the projectile can have on the size of the crater can be a fun and educational activity for kids. Procedure: Pour about an inch of flour into the cake pan to represent the rock and dirt on the planet. Before each “impact”, smooth the flour using the ruler and sprinkle a thin layer of cocoa powder on the surface. Effect of Projectile’s Velocity: Have your kids hypothesize again about how the velocity, or speed, of the projectile will affect the size and shape of the impact crater. Choose one of the projectiles to use for all three speeds. Choose three different heights from which to drop the projectile (the higher the drop, the higher the velocity of the projectile). Measure the size of the crater each time, then discuss the outcome. No, I don’t mean science fiction like Disney’s John Carter. I mean a great NOVA movie like Is There Life on Mars? (which you can watch on-line for free!). A Traveler’s Guide to the Planets: Mars is a great video on the basics of the Red Planet. This is my favorite series on planetary science, and you can download each episode on iTunes for $2.99.